It's a new year and investors are always on the lookout for new investment ideas. To help with that, Market Folly has secured a 10% discount to Boyar Research's "Forgotten Forty", a 45-page report that profiles companies they feel will outperform in the year ahead. The discount expires on January 16th, so take advantage while it lasts. Their report features one-page snapshots of their investment thesis for each stock, a catalyst for value realization, and an estimate of intrinsic value. They've allowed us to share with you a complimentary copy of last year's report so you can see what you'd be receiving. *All performance results are unaudited. These results are as of The Forgotten Forty priced on December 12, 2013. Past performance is no guarantee of future success. 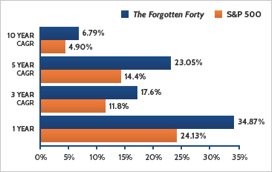 To save 10% on Boyar's Forgotten Forty report, click here to take advantage of the Market Folly discount. And remember, the discount expires on January 16th.